EAST CHICAGO, Indiana — Billowing plumes of white steam swirl around the towering steel matrix at the BP Whiting oil refinery, while blossoms of orange flame from flares light up the cold night sky. This is the backdrop to Marktown, an unusual enclave built in 1917 to house employees of a nearby steel mill owned by Chicago industrialist Clayton Mark. About a quarter of the pastel, stucco Marktown homes are now vacant and crumbling. There is a general appearance of abandonment and decay. But on the evening of Jan. 23 the Marktown community center was bustling, packed with residents confused and alarmed about the news circulating over the past few days. “This is more people than I’ve ever seen in Marktown,” remarked one local, who declined to give his name. Kim Rodriguez, a 54-year-old lifelong resident, had called the meeting to try to save the neighborhood. That’s because BP officials recently acknowledged they are looking to buy up and raze Marktown homes. Since its founding, Marktown has been surrounded on all sides by heavy industry. But BP’s $3.8 billion expansion to process Canadian tar sands oil means the refinery is now much closer to the historic district, separated from the northwest edge of town only by 129th Street and a relatively narrow green space. Rumors had swirled for a few weeks about BP’s meetings with several local residents, including at least one man who had approached the company seeking to sell numerous properties and another, history buff Paul Myers, who is passionate about preserving Marktown. A Jan. 15 story in the Times of Northwest Indiana stoked residents’ fears. Between the many boarded-up, disintegrating buildings and the looming refinery — not to mention a tin plant, the ArcelorMittal steel mill, BP tank farms and other industry nearby — Marktown isn’t what most people would consider idyllic. But it is also a place rich with history, where neighbors know each other, large extended families live in multiple houses on the same block, and a spacious home can be purchased for less than $20,000. It is a place that Rodriguez said she will not leave, no matter what. BP spokesman Scott Dean said in an email that the company is “interested in the properties along its boundaries” to provide additional green space, as well as parking and equipment-staging areas for the refinery. “The modernization project will create additional production activity inside the refinery adjacent to Marktown, including increased rail traffic adjacent to Marktown and barge traffic on the Indiana Harbor Ship canal adjacent to Marktown.” He said they will work with “willing sellers” and offer fair market value. Residents who don’t want to leave their homes can simply refuse to sell to BP. But attendees at the meeting clearly saw themselves facing a major showdown with the powerful company. They think that two men who own numerous buildings and do not live in the neighborhood will sell their properties, and they worry BP officials will tempt or pressure other residents to sell. The more homes that are sold and demolished, the harder it will be for remaining residents to jumpstart a rehabilitation of Marktown. Rodriguez, Myers and other residents have been pushing for comprehensive restoration for more than a decade. In 2008 they drafted a formal revitalization plan. Indiana Landmarks twice named Marktown among the state’s 10 most endangered landmarks, and Marktown was also named one of the “Seven Wonders of Northwest Indiana” in 2007 by the by the Times of Northwest Indiana newspaper. 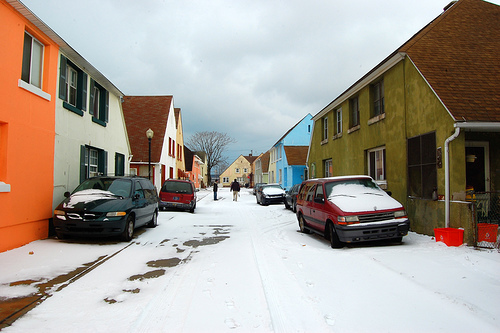 In 1975 Marktown – which is officially part of the city of East Chicago, while the refinery is in adjacent Whiting – was placed on the National Register of Historic Places. That means federal resources cannot be used for redeveloping or destroying structures. But the historic designation offers no such protection against private development or demolition by an entity like BP. A month earlier, sitting at her kitchen table surrounded by Christmas decorations and countless family photos, Rodriguez reminisced about her childhood in Marktown. Ice-skating on the frozen flooded basketball court, playing ping pong in the community center and buying snacks at the local bar, where kids were allowed as long as they didn’t sit on the stools. At the meeting, Rodriguez pleaded with other residents to join her. A ‘step child’ or a priority? It looked like Rodriguez had no shortage of supporters. Rosendo Cuevas, an East Chicago city councilman, asked for a show of hands from people who want to hold on to their homes. About half the crowd responded. “If the people stand united, it’s not going to be an easy fight for BP,” he said. Another East Chicago city council member, Benita White Arnold, urged the residents to develop a phone tree and plan of action. Three of East Chicago’s nine city council members were at the meeting, along with at least one former council member. While they expressed their support for saving Marktown, numerous residents complained that the East Chicago city administration has long “treated Marktown as a stepchild,” in the words of resident Javier Madrigal. The next evening, Jan. 24, the East Chicago redevelopment commissioner held a community meeting regarding an unrelated redevelopment plan for the town’s North Harbor area. Rodriguez and about 10 other Marktown residents attended, seemingly outnumbering North Harbor residents and peppering commissioner Maria Becerra with questions. Becerra said she hadn’t been aware of the BP situation or the previous Marktown redevelopment proposal, but would look into it. Advocates who live near the BP refinery outside Chicago say recent fines for pollution violations are “less than a drop in the bucket” for the company.